WeChat has become an indispensable part of life in China. In early 2018, WeChat users have reached 1 billion in total. Wherever there are people, there shall be marketing value. Lately, many companies have begun to explore the WeChat marketing model. Leveraging the current WeChat functionality and Open API Interface, WeChat marketing model has matured drastically. In this article, we will discuss 15 WeChat marketing strategies as a result of an in-depth case study. WeChat Service accounts (服务号): appear as friends in the chat section of WeChat. 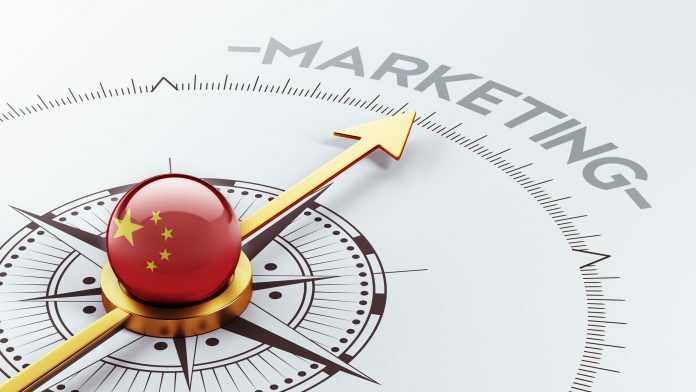 They are extremely visible and have additional features compared to subscription account (in particular WeChat login, WeChat payment and geolocalization). 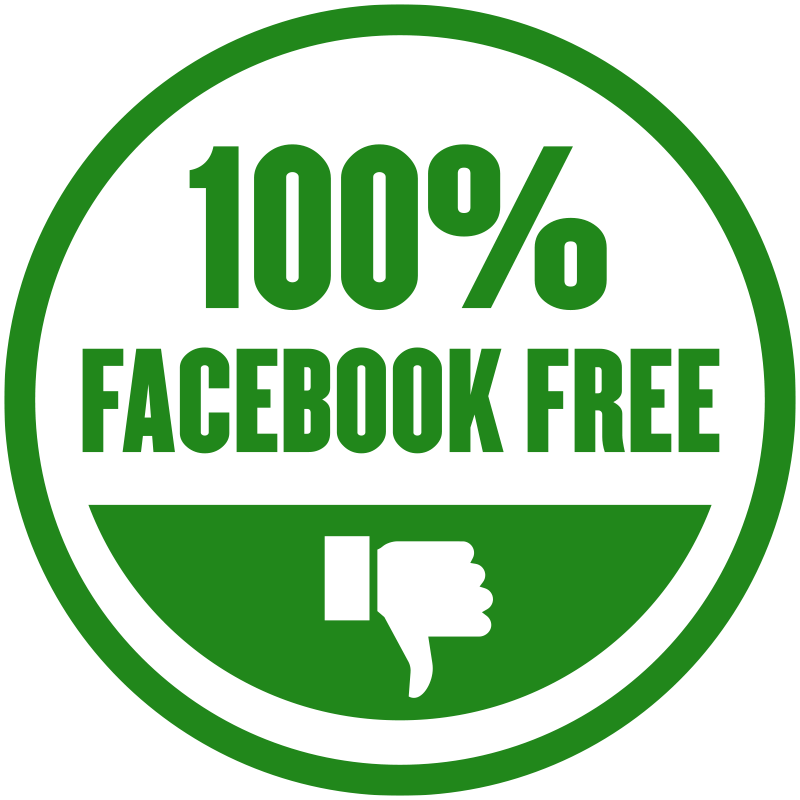 However, they can only post 4 messages per month. WeChat mini-programs (微信小程序): is a new type of account launched in January 2017 by Tencent. They are mostly used for offline applications when user are only meant to use the APP once. They can’t send push notifications. Knowing this important differentiation, let’s dive into the marketing. 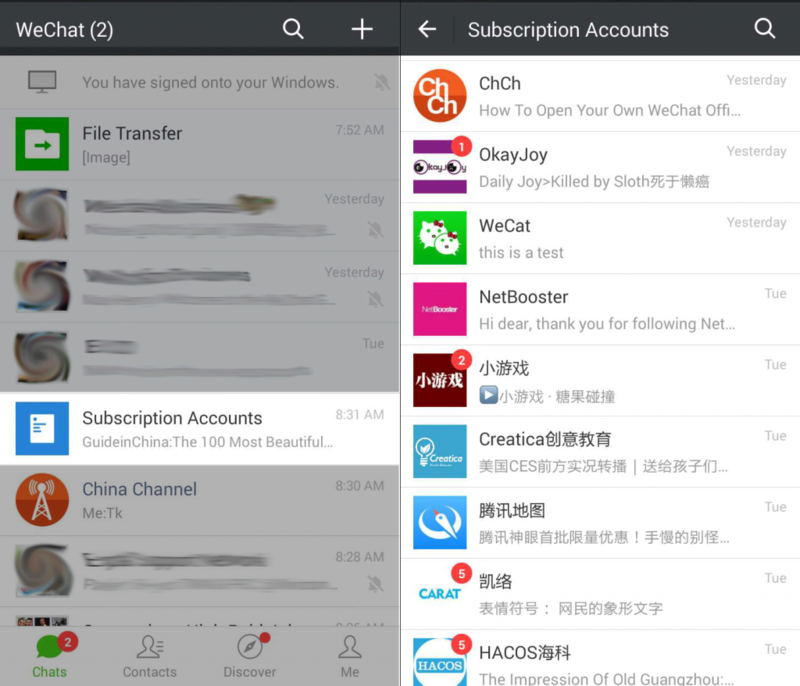 WeChat Service Accounts offer an open API (Application Programming Interface) Interface, which allows companies to define their own custom menus. In essence, the service account becomes close to being a SCRM (social customer relationship management) system. It’s purpose is to provide more convenient services for the enterprise users. The mode of communication has shifted from massive messaging to an entire audience, to more personalized one-on-one communication with a higher degree of human touch. This model is suitable for enterprises that offer systematic corporate services with a high demanding user base. 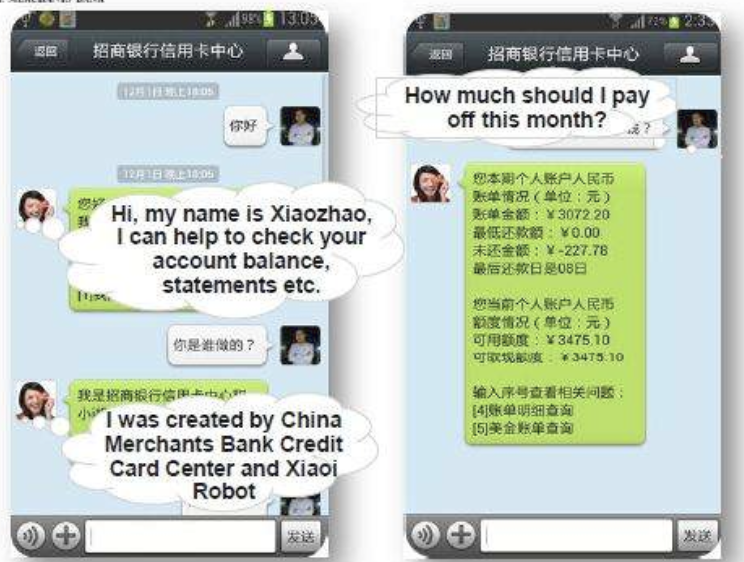 Take China Merchants Bank as an example: there WeChat account almost replaced 90% of their regular customer service functions, greatly reducing the customer service pressure of an average annual growth rate of 50%. China Merchants Bank’s custom menu allows users to check bills, transfer remittances, investment banking products, points inquiries and so on. In addition, the bank’s service account also began to replace the SMS alert functionality. Every time an end user swipes his/her card, they will receive a WeChat push reminder, while an SMS was only send as a reminder for a single card transaction higher then 100 yuan. When using service content, a link within WeChat towards a mobile HTML5 page is provided, which is a miniature version of their official website. At present, there are also similar used cases for Xiaomi Mobile, China Southern Airlines, Guangdong Unicom, CCTV News, and Guangzhou Police. B2B companies can also benefit from this model. In particular, upstream manufacturers provide corresponding services to dealers through the WeChat public platform, which lowers the business threshold. On the public platform of a chip vendor (KeTong XinCheng or 科通芯城), dealers can query new products, special promotions, prices, orders, shipments, receivables, and inventory through custom menus. This method greatly reduce the cost of communication and information asymmetry between each other. This model is suitable for products or brands with after-sales activities, providing good after-sales follow-up to consumers, hence increasing customer satisfaction. Take the Xiaomi mobile phone public service account as an example. Xiaomi mobile phones provide several activities, services and products in their customized WeChat menu. The most important feature is the human customer service answering questions and concerns from Mi Fan’s (nick name Xiao Mi product fans). It has become Xiao Mi’s main customer service channel, dealing with client concerns daily from 9:30 AM to 21:00 PM. This activity model has matured to enhance interaction with fans and engage fans in branding activities. Content can be delivered in several formats, including interesting text, comics, video, music. Interesting text content: Durex’s one-weeks quiz collection is an example of this. It’s easy and fun to answer these questions by collecting fan questions and using humorous language. Comics: Comics is a format fans really like to watch. Lenovo’s WeChat was mainly based on comics and was adored by fans. Xiaomi’s WeChat account couldn’t remain behind and also started to offer this format. Video & Music: original video music is a good product marketing vehicle. The public account of Quinta micro-movie box, is mainly featured to provide children with original children’s stories and push them in audio form, which is loved by their mothers. This is mainly based on the keyword auto-reply function provided by WeChat. When the target customer has relevant requirements and sends it via WeChat, the system will push the most appropriate service for the fans according to the keyword. A representative case of this model is the voice of FM93 traffic radio, a traffic radio station. Drivers generally want to know the road conditions, violations, weather, etc. through the radio. These requirements can be customized through WeChat. At present, drivers can send keywords to the voice of FM93 traffic to check the road conditions on their way, as well as the weather in their city, as well as their own or other violations. This results in increased travel convenience. This mode is different from human chat. In order to meet the needs of fan chat, a brand creates a large library of keywords. By setting one or more sets of relaxed and humorous sentences under each keyword, they attempt to show fans their human side. The representative case of this model is Changhong, which it’s electrical appliances different personality personification, aka anthropomorphism. Anthropomorphism is the attribution of human traits, emotions, or intentions to non-human entities. When fans interact with Changhong, they will get a response from various anthropomorphic appliances. This will deepen the impression of the brand with its potential customers. Similar examples include Beijing Real Estate or Renren’s small yellow chicken. WeChat can not only be used for promoting one’s brand image. Cultivating a brand’s most loyal consumer groups as another important use case. This would be implemented using the group functionality inside WeChat. For example, a brand adds loyal fans to a group through online and offline activities, forming a virtual club. In these group, internal competition is stimulated by introducing hard-to-get privileges, such as an image ambassador for example. All fans in this group will take responsibility for promoting the brand. Taking the automobile as an example, using the multi-screen interactive technology, a micro controller can be connected. The micro controller is remotely connected with your WeChat account. For example, by using WeChat and shaking your smartphone, one can see the appearance or panorama of the car. This model is most practiced by store-like brands as Yoshinoya or McDonald’s. 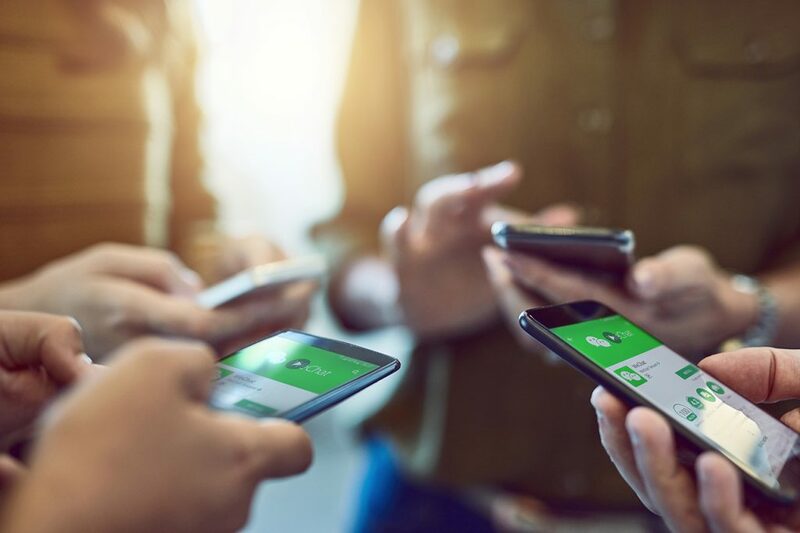 By organizing online WeChat events, coupons can be generated by developing apps, and consumers can use these coupons to shop at offline stores. Yoshinoya WeChat Marketing’s “Seeing Your Face” is the best practical example of this model. Traditional membership cards have material costs and are not easily distributed. WeChat now offers virtual membership cards instead. Shenzhen coastal city WeChat promotion activity is a good example of such. Users scan a merchant’s QR code, getting them a membership card. 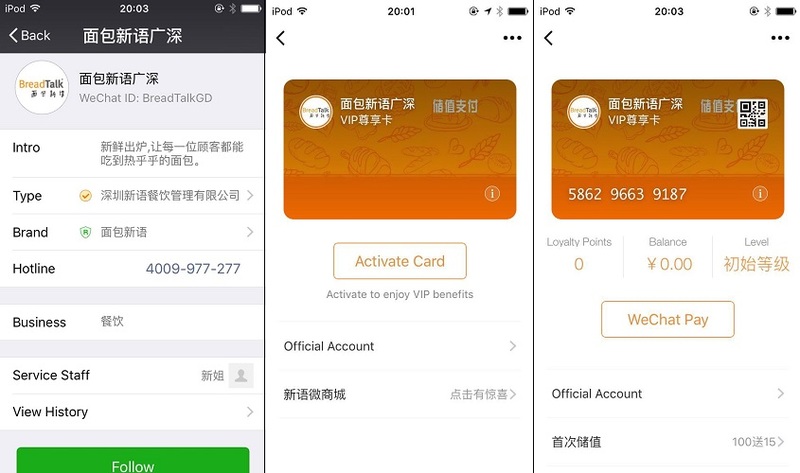 The membership card is stored in the user’s WeChat account. Members discount services are then offered for the specific merchant during consumption. Merchants get specifically target groups through WeChat, resulting in decreasing promotional costs. This is beneficial both for the long-term accumulation of brand reputation and its user volume. 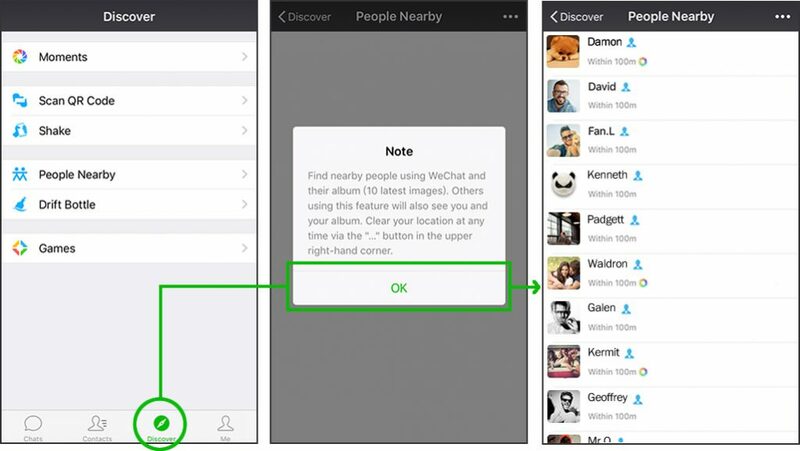 WeChat has the ability to detect and view people nearby. Merchants can put some attractive information, e.g. a discount, in there introduction. When a consumer sees the information, they can follow it on WeChat, scan the merchant’s QR code and get a discount. The introduction of WeChat payment functionality, has made it possible for friends to do peer-to-peer e-commerce. Based on the recommendation of a friend’s word of mouth, you can sell goods in a circle of friends. One such success story is Wang Feng selling watches. At the same time, consumers are encouraged to share coupons and other credits into their circle of friends. Friends can also get the same discounts through coupons, which will increase the intensity of promotion and the level of publicity. Member fees are created by Chen Kun, and this model can also be extended to individuals. If you have enough influence or have enough good content, try it. When you want to create a successful subscription account, you must share valuable niche content. Not being very specific about your niche offering won’t really work. You must be specific to stand out and subconsciously make the user think about you (top of mind) when he/she has a need, relevant to your offerings. For example, the recruitment of Social Beta only sends new media recruitment information. A WeChat user will remember this account when he/she has a job search request. The subscription account of Speedway.com only shares the content related to micro-marketing. One might also think of this account when one wants to know about the content of micro-marketing. Being very specific and relevant is key, as accounts being to miscellaneous will be opened less, as an end user doesn’t know what to expect in advance. He Qiang, now working as AI Product Manager and Project Manager for Samsung Research Beijing Office. Worked as the Technical Program Manager for Chinese Bixby, Samsung’s Very First Voice Assistant Product. Bixby is successfully launched on Nov 30, 2017, and very quickly reached it’s 1.2 M active users for Samsung’s Mobile Phone . Current work focus on Bixby 2.0 language extension project for APAC region. Beside that, he also work as Agile Coach for Samsung Research Beijing Office. Before current position, he had been working in Technicolor China for 10 years as senior software engineer & agile coach. He Qiang has very deep understanding about IT trend in China Market, especially in the AI industry.